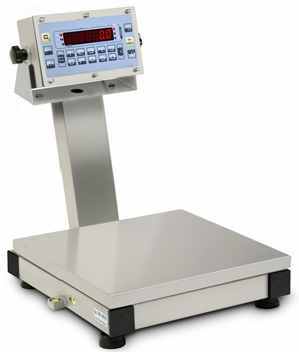 High resolution IP65 stainless steel balances for industrial and laboratory use. Particularly suitable for humid areas and for where there are strict hygiene requirements. The dual range models have a higher accuracy on the lower part of the range. Stainless steel structure, and plate. Bidirectional RS232/C or RS485 configurable output for PC, PLC and additional remote display. The dual range models offer a better accuracy on the lower part of the range. CEM APPROVED versions also available. Waterproof keypad with 18 functional keys. Stainless steel indicator with bracket for mounting on a column or shelf with adjustable angle. 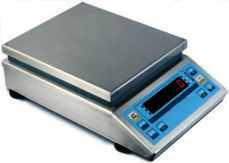 Stainless steel structure, mechanics, small parts, and plate. Easy Excel data entry: the weight data and the database fields may be transmitted to the PC, with operating system Windows XP Professional, without any added software. The indicator communicates directly with the active Windows application (electronic spreadsheet, word processor, database). 12 Vdc power supply with a built in 110-220 Vac power adapter. Horizontal / vertical / in unloading totalization with management of 3 zeroable and printable totals independent from each other (partial total, general total, grand total). Set point function active on all functioning modes. Zeroing, Gross/Net selection, HR Visualisation x 10. Print and/or data transmission command, function command, on/off. Automatic tare, presettable tare, lock/unlock tare function.